Is it just me or has this week gone stupidly quickly?! January always feels like such a long and weary month that drags on forever and then all of a sudden it's nearly gone. While this week has run away with me a little I'm hoping that next week goes just as fast because I'm off to Dartmoor for a few nights next weekend and I *can't* wait to have some quality time with my Mum and our family friends! Anyway, the prompt for this week is "List the soundtrack of your life right now" which I absolutely love because, although I tend to dump all the songs I love into one Spotify playlist, there are always some at any given time that I never ever skip and those are the ones that I'm loving at the moment. So, instead of doing a rambly post as I have been writing over the past few weeks, I thought I'd just share a playlist of the songs that I can't stop listening to right now below so that you can have a look for yourselves! Including some songs from the La La Land soundtrack (all of which are so beautiful), Ed Sheeran's new song and many more random songs that have caught my ears lately, I hope you enjoy this playlist and have a wonderful week! Happy Sunday everyone! The first week back of uni this year has come and gone in the blink of an eye and while I'm struggling a little to motivate myself with all of the assignments I have this term, it is nice to have things to be working towards again - for now, anyway! Being a bridesmaid for the first time when I was six - I might have the age wrong but it was definitely around six years old when my sister Tai got married and I remember having the absolute *best* day following her around, getting all dressed up, and dancing on the dance floor at the reception. When you're that young you really have no cares in the world or self-consciousness and so to me it was the most fun I'd ever had. My First Holy Communion - I was brought up Catholic and if you're Catholic then you know when you're around eight years old you have a day where you get all dressed up (girls in white dresses and boys in suits) to celebrate you being old enough and having learnt the teachings to have your first communion i.e. the bread and wine at church. It's a bit of a strange thing to put on your list of the happiest moments of your life considering I'm not that much of a church-goer these days but I remember having the most wonderful day with all my friends and family and it really sticks out in my memories of being a child. Surprise birthday party when I was nine - Keeping in the childhood theme, for my ninth birthday my Mum threw me a surprise party and I truly suspected nothing. My Dad had taken me out for dinner and I came home to my Mum's house and all of my favourite people started springing out of places - from under the table, behind the curtains, etc - for each line of the Happy Birthday song. It was amazing and I was so shocked and happy that I got to have a party I had no idea I was having! My first kiss with my ex-boyfriend - Ok so whizzing forward a lot of years this will always stand out for me. We're obviously not together anymore and not even in touch but I'd be lying if I said that this wasn't one of the happiest moments of my life. It was one of those moments where your life feels exactly like a movie and I don't think I'd ever felt like that before this. Lunches with Mum at Cafe Rouge - My Mum and I used to have this great tradition on a Saturday morning every few months when she'd go swimming and I'd sit and read at the side while she did (story of my life haha) and then we'd go for lunch at Cafe Rouge in London Bridge - I'd get a chicken baguette with chips and Mum would have tarte tatin (her favourite!). I remember those Saturdays so fondly and loved that quality time with my Mama so much. Wales in the Summer after GCSEs - When I was sixteen my friends and I went to Mumbles in Wales for a week and had the most amazing time. It was my first holiday without my parents that wasn't a school trip and I loved it. One particular moment that I remember being happiest was when we were having a picnic on the sunniest day on Rhossili bay beach. Rhossili is truly one of the most beautiful beaches I've ever seen and the five of us would laugh non-stop about everything. My Godfather's speech on my eighteenth birthday - On my eighteenth birthday my Godparents kindly let me host a birthday lunch at their house and my Godfather made such a lovely speech about both me and my Mum and I wish I had filmed it because it was such a special moment. Barcelona with my favourites - After we'd finished our A Levels my sixth form group of ten girls went to Barcelona and it was definitely one of the best weeks of my life. Both the city and the fun we had there will always be in my mind as a highlight of my teen years. Seeing Taylor Swift live at Hyde Park - There's nothing in the world that compares to seeing your favourite singer live. Never mind when you get to see them with your best friend in an outside venue on the sunniest day London has ever seen. As I'm sure you can imagine, it was the most magical evening. Opening my A Level results - I know that in the long run A Levels don't matter all that much but opening them and seeing how well I'd done was probably the proudest moment of my life and knowing that all my hard work had paid off was amazing. Radio 1's Big Weekend - Just as I said before, seeing live music is one of the things that makes me happiest and this day was so much fun. Between it being a beautiful day, spending it with the best people and seeing Coldplay three rows from the front, you can't top a day like this in my opinion. Seeing Andy Murray win Wimbledon - Getting to stand in a line and see Andy Murray walk to his dressing room with the Wimbledon trophy is a moment I'll never forget. It was the perfect end to the most amazing month I had working there with some of my favourite people. 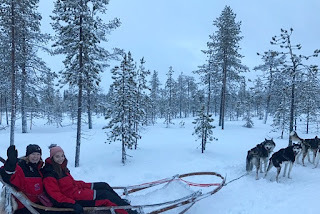 Driving a husky sleigh in Lapland - I wrote about this in my travel diary of Lapland on Wednesday but, as you can imagine, this was unlike any experience I've ever had and driving a husky sleigh through the most stunning snow-covered forest at night was just surreal and I was so utterly happy during that hour. Sorry that this has been a bit of a mammoth post - it turns out I have a lot of happy moments to write about and be grateful for! I hope you all have a great week and I'll be back soon I'm sure! My Mum has wanted to go to Lapland for as long as I can remember. She's always loved the cold and snow and dark mornings that Winter brings and so going to somewhere like Lapland is truly her idea of heaven. 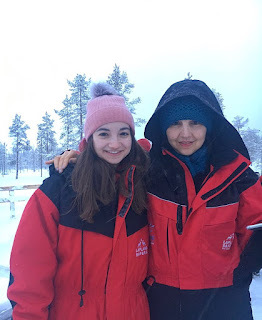 Last week, along with two of her closest friends, we stayed in Lapland for three nights and it really was magical. On Tuesday morning we flew out bright and early to Kittilä and got on a coach to Yllas where our hotel was. As soon as we got off of the plane in the tiny Finnish airport we were overwhelmed by how stunning the landscape was. Pictures will never really do justice to how beautiful Lapland is because I think that half of appreciating it is experiencing the temperature and the atmosphere in real life, so you'll just have to take my word for it when I say that it is so worth seeing with your own eyes! Once we'd got to the hotel, sorted out our snowsuits and boots that the hotel kindly provide you with, we went for a walk around the little town nearby. Although it was freezing (-16 degrees celsius on the first day), it didn't feel too cold and, coming from someone who deals with the cold very badly, that's saying a lot! You definitely need to wrap up warm but the cold isn't as piercing as you might expect so if you don't like the cold, don't let that hold you back if you're ever considering a trip to Lapland! That evening we just relaxed, planned our activities for the next couple of days and had a very early night since we'd had to get up at 3am to catch our flight that morning! The next day, once Mum and her friend Maddy had got over the excitement of the fact that it was still dark at 10am (they're honestly two of the very few people I've ever come across who love the fact that there's so little light during the daytime when it's Winter! ), we had the opportunity to have some tasters of some of the activities we could do during our stay. These included reindeer rides, husky rides and driving snowmobiles. 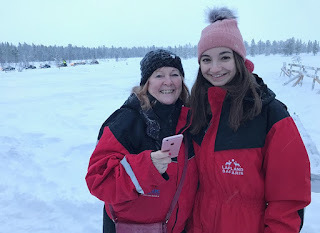 It was such a lovely few hours trying everything out and, although we didn't choose to book onto the full experience of driving snowmobiles, I really enjoyed driving one around a small track and would definitely do it again! That evening we'd booked to have a husky ride through some beautiful woods which is meant to be a great opportunity to see the Northern Lights. Seeing the Aurora Borealis is something I've wanted to do for years but sadly it wasn't cold enough and the skies weren't clear enough for them during our stay, which I've taken as a sign that I'll just *have* to go back and try again next year! Not seeing them that night wasn't a disappointment in the slightest though when it came to it because I had the most incredible experience on the husky ride. We got to drive our own husky sleighs the entire way and, because I was paired with Maddy who didn't want to drive the sleigh, I did it the whole 10km route we went on. I can't begin to describe how amazing it was and how clever these dogs are. At first I was worried at the thought of them carrying our weight as well as the sleigh so far and felt quite cruel that I was putting them through it, but even just two minutes with them made me see how much they love it. Whenever we had to stop for whatever reason they would bark and bark and be raring to go to the point where, despite the fact that we'd been told to only put one foot on the brake to stop them, they could still go when they all tried their hardest so I had to put my entire body weight on the break to hold them back! As soon as they were allowed to go they would fall back into silence and seemed so content. The experience of spending an hour travelling around the beautiful snow-covered forest in almost complete silence is utterly indescribable - I don't think I've ever felt so at peace while also feeling elated at the joy of driving the huskies in my life. It's safe to say this was the standout moment of the trip for me and I'd love to do it again and again! 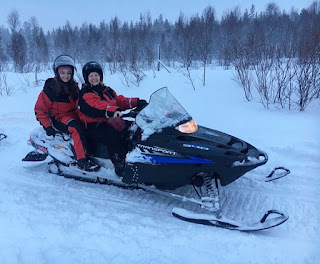 On our last full day we had a reindeer ride booked for the early afternoon, which was a similar experience to the night before in that we got to drive the reindeer sleighs and rode through a stunning forest. Again, it was such a beautiful afternoon and, although I preferred driving the huskies simply because it felt more exciting, I adored this too. 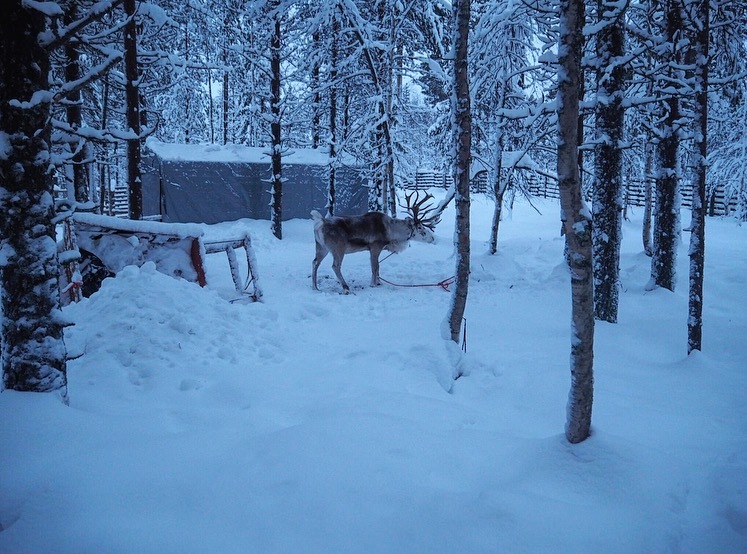 After both the husky ride and the reindeer ride we were taken into a cabin with a roaring fire by the people who look after the animals and treated to some hot juice and cookies while they answered any questions we had about the huskies/reindeers. I have to say I found the Finnish people I met absolutely wonderful and they really seem to care about the well-being of the animals they keep. Their way of life is so very different to mine and it was hugely eye-opening to hear about their experiences and how they spend their year. There's definitely something to learn from those who don't live like us - their lives seemed to me to be so much less centered around technology and earning money and so much more about living in the moment and in nature. I'm not saying that one way of living is better than the other by any means, just that I think it's important to see other ways of living, if nothing more than to gain some perspective on our own. 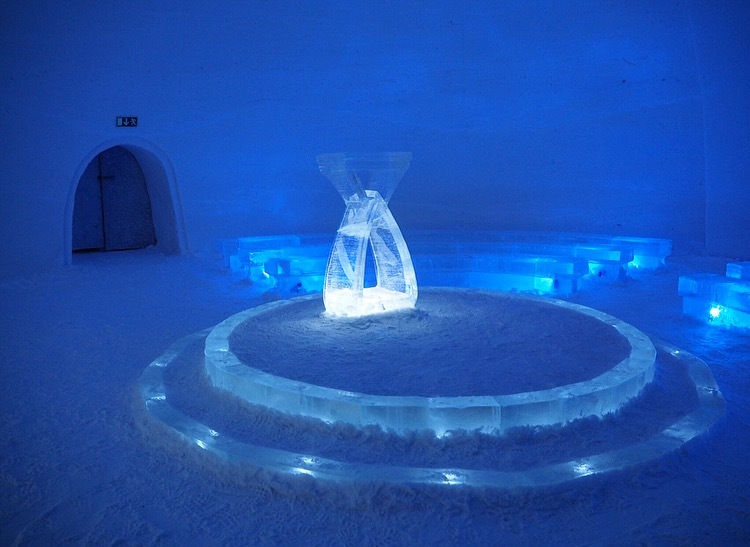 In the early evening we went to the Lapland Snow Village, which is an incredible building made entirely of snow and ice that is built every Winter. It's incredibly impressive, with an ice bar and restaurant, rooms with beds you can book to stay in and even a chapel pictured above where you can get married should you wish to! 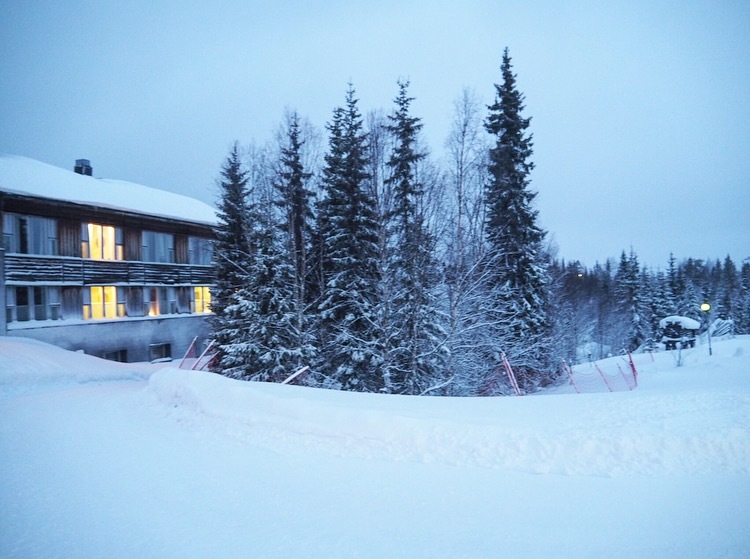 I have to say, staying overnight or getting married there would definitely not be for me but it's an incredible thing to see that I'd definitely suggest if you're ever in Lapland! 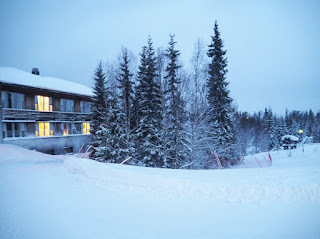 Before we knew it it was Friday morning and time for us to say our goodbyes to Lapland. I really did love every minute and could see myself going back there year after year without tiring of it - the people, the food and the beauty are just magical and if you ever get the chance to go make sure you take it! Good morning! I hope you've got a lazy Sunday planned out ahead of you - aren't they just the best way to recharge before the beginning of a new week? 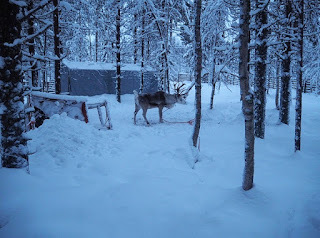 I'm heading back to Exeter today after an amazing trip to Lapland this week (blog post hopefully coming soon!) so I've got a long drive to get through before I can do any relaxing unfortunately! 1 // Rory Gilmore (Gilmore Girls) - Rory was the first character that popped into my head as soon as I saw this week's prompt. Granted, I'm currently watching Gilmore Girls (no spoilers please!) so it's on my mind a lot of the time but I just adore Rory - from her eagerness to learn to her humour to her fashion sense. The best part of Rory for me is that she's not perfect, in fact she's far from it; she makes hundreds of mistakes and messes up but that's what makes her such a 'real' character. She's so relatable to me and I love her! 2 // Logan Huntzberger (Gilmore Girls) - Logan's character is a later edition to Gilmore Girls and, since I haven't finished it, my opinion of him may still change but right now he really embodies the perfect guy. Again, his character has many flaws (he's perfect in a realistic way to me!) but he's cheeky and smart and treats Rory so well that he really is one of my favourite fictional characters, no matter all the people who say that they love Jess more! 3 // Joey Potter (Dawson's Creek) - I started watching Dawson's Creek when I was around thirteen and even just thinking about it makes me so nostalgic for that time in my life. Joey was everything that I wanted to be at that age, she's smart, beautiful and keen to learn all about the world around her but often scared and insecure too. She'll always embody that time in my life for me and so Joey Potter has to be on this list! 4 // Peyton Sawyer (One Tree Hill) - I started watching One Tree Hill once I'd finished watching Dawson's Creek and was a little bit older, around fifteen or sixteen, and I was absolutely obsessed with Peyton Sawyer's character. I was a fully-blown teenager when I watched this and so was Peyton, and although she had a flair for the dramatic and I know many people found her character annoying, she was the character I aspired to be at that age and even if I wouldn't so much now, I'll always have a soft spot for her. 5 // Lucas Scott (One Tree Hill) - Much like my love for Logan in Gilmore Girls, Lucas was always my favourite when I was watching One Tree Hill. He's majorly into reading, has great integrity and is incredibly attractive; all the makings of a great tv character! 6 // Sam Seaborn (The West Wing) - Firstly, Sam Seaborn is played by Rob Lowe, and who doesn't love Rob Lowe?! Secondly, Sam is the most intelligent and kind character I've come across. He has an innate aim to do good and to help people which always made him incredibly admirable to me. Not to mention his charm, wit and sharpness - I love him. 7 // Augustus Waters (The Fault in Our Stars) - Oh, Augustus Waters. I doubt I'm the only one of my generation to have fallen head over heels for him. People say this a lot and I know it's cliched to say so but I read The Fault in Our Stars long before it had blown up and everyone seemed to be talking about it. And in that time TFIOS felt like my secret discovery - I loved that book to pieces and Augustus' character just killed me with how sweet and clever and brave he was and I think I'll always remember the first time I read this book because of that. 8 // Matilda (Roald Dahl's Matilda) - Growing up I loved Roald Dahl books, much like everyone my age seemed to! Matilda always stuck out for me as I liked to think of myself as someone who loved to read and who would stand up for what was right when needed. This book is a masterpiece and Matilda's character was such a great role model for me throughout my childhood that she's always stayed in my head as someone to aspire to be! I could go on and on with more characters I love but I think I'll leave it there this week. It's funny that most of the characters I've picked are representative of really formative years for me - I think in our teens we (or at least, I know I did) lock on to characters we relate to or want to be to help us understand everything that's going on in our lives and how we see the world, and they've obviously stayed with me since watching/reading about them! Do you love any of these characters? I'd love to hear your thoughts and who your favourite characters are too! Happy New Year everyone - I hope the first week of January hasn't been too hard on you. I'm lucky enough not to have any January exams this year so I've just been relaxing at home and catching up with friends and all those nice things! Anyway, let's get down to today's post. If you know me at all then you'll know that I'm an incredibly reflective person and that I have a deep-rooted love for both stationary and lists. I've kept a diary for years now because I love the act of writing it every day and having entries to look back on years later. So, (I'm getting to the point now I promise) when I saw this 52 Lists Project book in Oliver Bonas in the weeks leading up to Christmas, I knew I simply *had* to buy it. The book is essentially a reflective notebook, split into four sections relating to the four seasons of the year, and contains 52 prompts to set you off making a list each week of the year. Lists range from things like your favourite songs to things that make you happy to places you want to travel and more. I completely adore the concept and thought to make sure that I actually do it every week I'd type up whatever I make a list of in the notebook here so that I have an online record of it as well! And that brings us on to week one's list, which says "list your goals and dreams for the year". I know you're probably sick of reading posts about new year's resolutions at this point but I want to save these lists for Sundays so I hope you'll decide to humour me and have a quick read through mine! Now I've gone back and forth over the years when it comes to setting resolutions in that sometimes I have and sometimes I haven't set concrete things I want to do. Last year I just set one mantra I wanted to live by and I quite liked that way of doing it but, when I saw that the list this week was to make some goals it got me thinking and I quickly found a few things I'd like to achieve this year. Give more money to charity - A philosophy module I took in the Autumn term really shook me into realising that while I'm by no means rich, I can easily afford to give a bit of money every term to charities that are doing tangible good in the world and that it's not ok to ignore the terrible suffering so many people are going through anymore so I'd like to aim to give at least some money to charities I trust like Help Refugees UK every month. Do yoga a minimum of once per week - I love yoga but I don't make enough time for it or I go through phases of doing it every day and then months on end not doing it once. I want to change that this year and make sure I do at least one session once a week. If you're looking to do yoga at home I can't recommend Yoga with Adrienne highly enough. Have a set Sunday self-care routine and stick to it - Things like painting your nails, exfoliating and putting on a face mask don't sound very important but taking the time to do them always makes me feel like I have my sh*t together and better about everything so this year I want to make sure every Sunday I do them without fail. Travel to three different countries (Romania doesn't count) - Travelling is one of my favourite things to do and since this summer will be the last one I have before I finish uni (wow that's terrifying to write) I want to make the most of it and see new places, at least three this year. Save 10% of every pay check - Travelling is crazy expensive. Sure, there are ways of doing it on a budget but it's nice to not have to worry too much about money if you can, so that means saving if I want to fulfill the goal above! I've got a part-time job at uni this year and I really need to get better at saving some of the money I make instead of spending it on things that I definitely don't need. 10% isn't that much but it'll definitely make a difference to my summer fund so I need to start doing it! Read at least two books a month - I want to read more and two books a month seems like it's definitely achievable so I need to get on that. 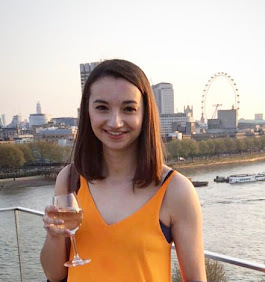 Make more conscious and ethical choices - Following on from the first goal about the module I took and how I've realised there's no excuse for me not doing more good, I want to try and be more conscious in the choices I make and the things I'm buying. I recently watched Hannah Witton's video looking at how cruelty-free her make up is and was genuinely shocked at how many brands don't produce make up without cruelty to animals being done. Since there's an accessible and comprehensive website which lists which brands are and aren't cruely free in the production of make up, I feel like I really have no excuse to not buy from brands that are cruelty free from now on and so I'm going to try and research into things before I buy them. Go pescatarian for Lent - One of the choices I want to be more conscious of is the food I eat. Now I love bacon as much as the average next person if not more and have lived my entire life eating meat but it's been drawn to my attention more and more how badly some animals are treated and the huge environmental impact farming and eating meat has. I don't know enough about it yet and this is not me by any means saying that I'm going veggie but I want to do some research this year and I'm going to start by reading Eating Animals by Jonathan Safran Foer and going pescatarian for Lent more than anything to see how I get on - I imagine that it will be a lot easier than I think it will but we'll see! So those are my goals for 2017. Overall I really just want to be a better person this year, in any way I can and these are a few small steps I'm going to take to do that. 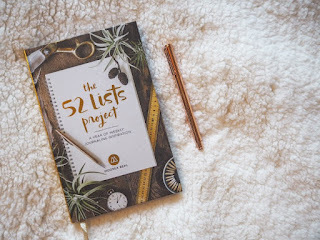 I hope you like the idea of the 52 Lists Project - they won't all be as rambly as this one I promise but since the first week was setting some goals for the entire year I wanted to elaborate on them a bit! Have a wonderful Sunday whatever you're up to and I'll see you next week if not before for week two!